Amidst all those crazy abbreviations for medical exams, today brought a weird allergic reaction, a pending test result, a fairly good test result, a series of unknown data, and an interesting observation. Oh yes, and a run-in with my favorite Mott buddies! Warning… this post is ridiculous in length. As in you might need to read it in chapters. I tried to scatter in a lot of pictures for your visual pleasure! Colten and I left Lansing around 5:45 AM and arrived to Mott Children’s Hospital in Ann Arbor around 7:20 AM; a couple pit stops along the way made the trip a little longer this time. Colten was only allowed clear liquids after 1:30 AM, and since he is a wonderful all-night sleeper, his last bottle was at about 8:00 PM last night. So when I roused him early this morning, I gave him a bottle of diluted apple juice and off we went. Colten was scheduled to do a “trial” CT scan without sedation first. Anytime the medical staff can avoid putting a child under two years of age out, they’ll attempt the non-sedated version. If that didn’t go over well, the regular CT with sedation was scheduled for 9 AM. Colten was called back around 8AM for the trial. 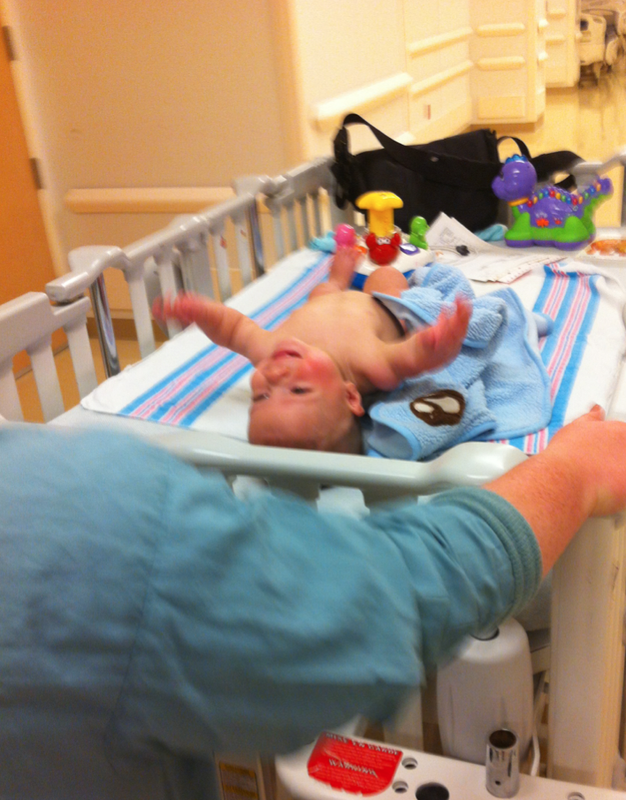 We went into the pre-op area for vitals and to wait for him to be transported to the scan room. 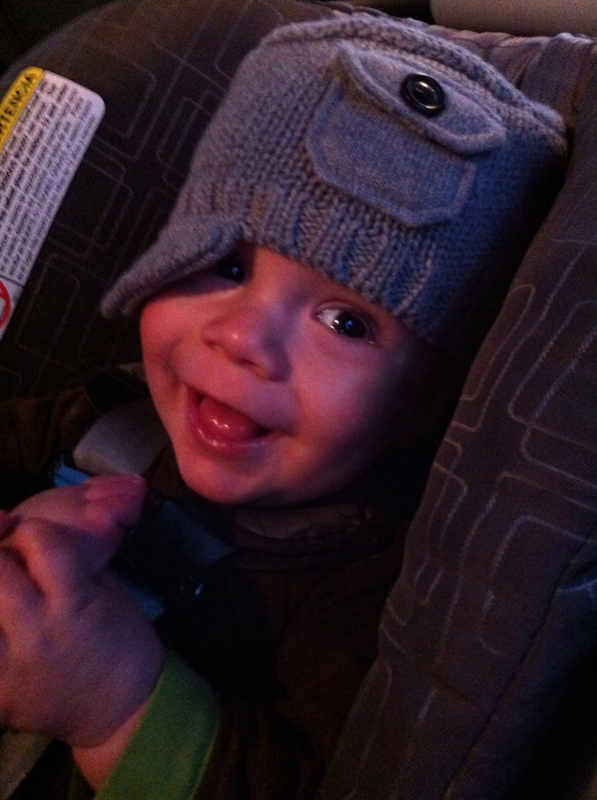 Colten was in a good mood (how could he not be – he was hopped up on juice! more on this later) playing in the lobby and back in pre-op. 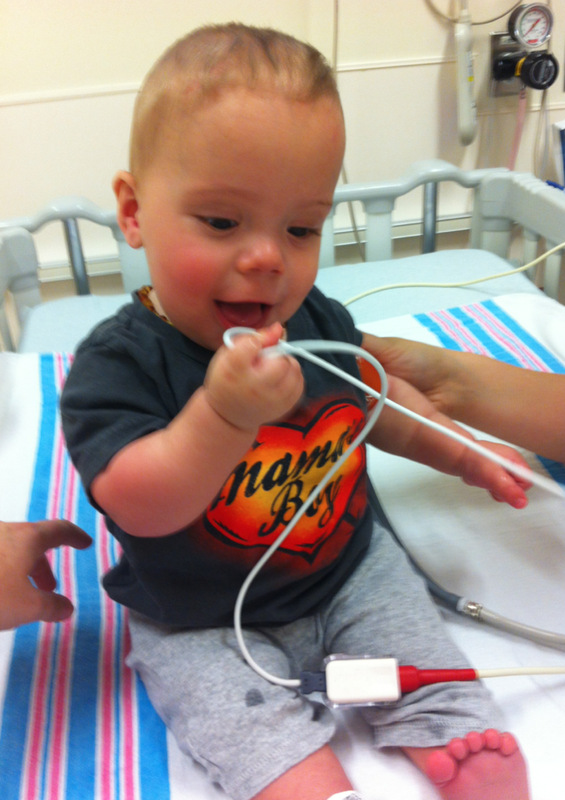 He was quite the charmer and all the nurses that walked by did a double-take at him sitting up in his bed, happily chewing on cables or playing with toys. Try a CT without sedation. Fail. Sedate him. Do a SECOND CT under sedation. Start urology stuff under sedation. Go right to sedation. Do a CT, then start urology under sedation. As I said, Colten was up and energetic. Watching him, I knew we had a very small chance of getting him to lay still for 7 seconds. Perfectly still. So I finally agreed that trying it without sedation was not necessary. I was pretty much choosing between either 2 CTs and sedation, or 1 CT and sedation. We agreed that 1 CT and sedation was better on his little body. While sedation is risky, radiation has more long-lasting adverse affects on the body (from what I understand). After I was confident in this decision, the nurses continued with vitals and the anesthesiologists started to talk through things. Suddenly, I noticed Colten’s right arm was bright red, a little puffy looking, and hot to the touch. Nurse: I’ll put in an order in for Benedryl and Tylenol. Me: No… but why Benedryl AND Tylenol? Nurse: Usually in this situation we do both. Nurse. Hm. That’s what we always do. But I’m not sure how it would help him! I’ll just do the Benedryl. Me (to myself): Damn straight. Don’t drug him up just because! So we got him on Benedryl, which the hungry boy took right in. Hesitating to do anesthesia now because of this weird reaction, the staff agreed that we would try the CT without sedation first. We hoped the Benedryl might make him a little sleepy and if we could get him to just fall asleep, it might actually work. I’ll spare the details of the non-sedated trial. It didn’t work. However, the gentleman running the CT scan didn’t even do the trial. He patiently waited to see if Colten could stay still and said he hated to dose him twice, so if he didn’t feel like he would stay still long enough, he simply was not going to run it. He would wait till he was sedated. And he did. So we did kind of try, and Colten still got only one dose of CT radiation. Onward… As Colten was taken from the scan back to recovery, the urology nurse met him there and was able to get the catheter in while he was still mostly out of it. Yay! Then they ran their test. Mostly what they’re looking for is how the bladder fills and empties. They drain it, then fill it up with fluid and see how it responds. Because the nerves to bladder, bowel and sexual function are at the lowest part of the spine, it’s almost guaranteed that every person with Spina Bifida will have problems in those areas, to varying degrees and manageability. As I was brought back to recovery to see Colten, I could hear him crying – he was up and NOT happy and very hungry. Or not. He only drank a few ounces that conked right out in the carrier on me. 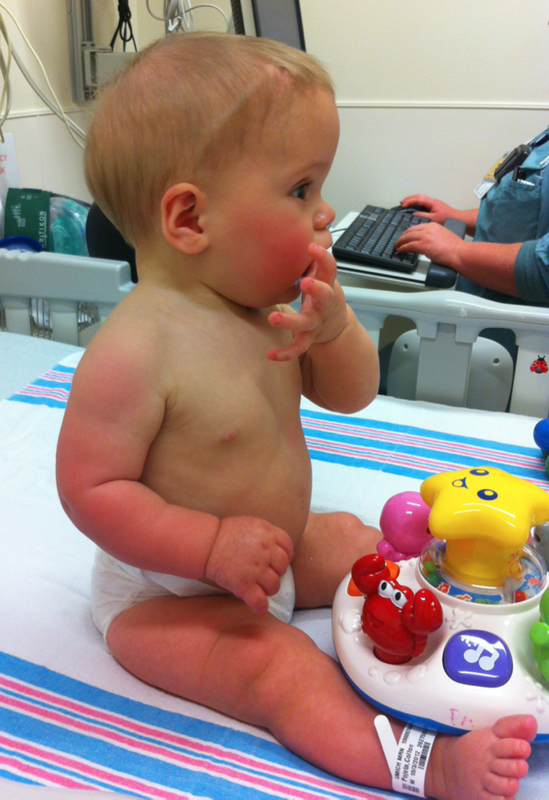 We got out of there and headed to the Pediatric Urology Clinic for the results with Dr. Wan. He did a great job explaining bladder function to me and hopefully I can relay it here, for those that are interested. Let’s imagine a balloon… if we fill it 10% with air, it has very low pressure and would be hard to pop. If we fill it 90% with air, it has high pressure and the walls are taught and it’s easier to pop. In a person without spinal cord issues, the bladder is NOT like a balloon. It doesn’t matter how much we fill it, 10% or 90%, the pressure will remain pretty stable. In a person with spinal cord or neurological issues, the bladder pressure does increase. This increase in pressure can cause uncontrollable leakage or various issues with the kidneys. Thankfully, that’s about all we need to know right now because Colten’s pressure point (?) is a little high, yet acceptable. It’s not necessarily in a normal range, but it’s good enough that we don’t need to worry about changing what we are currently doing (which is nothing!). We go back in six months for another kidney/renal ultrasound (checks to make sure the reflux isn’t damaging the kidneys) and another CMG. Colten will remain on a daily prophylactic dose of Bactrim to help ward off UTIs. 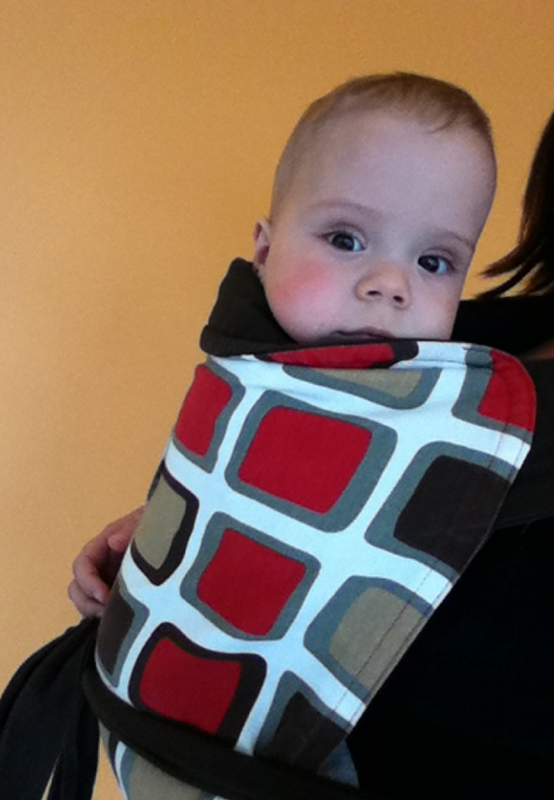 We are exploring more natural options for this and finding a lot of mixed reviews and results. Finally onto the DXA scan. This is the scan that measures bone density. 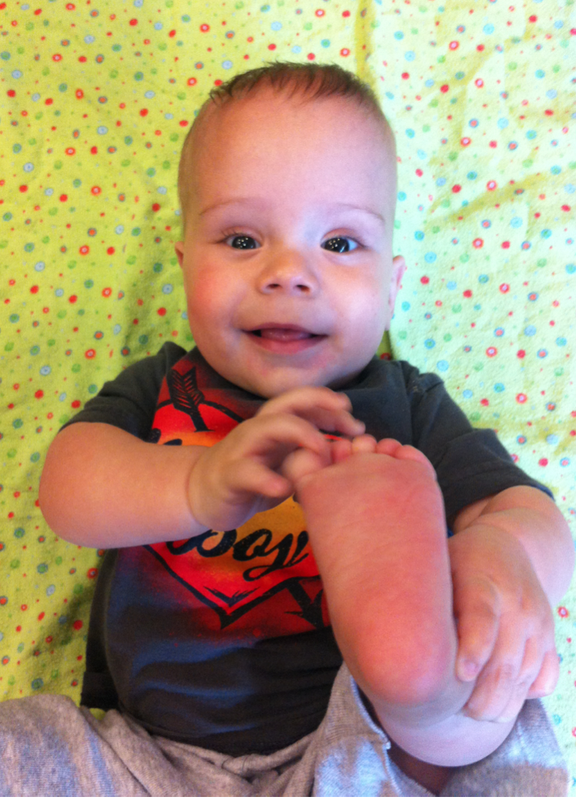 Colten’s participation in the University of Michigan’s Myelomeningocele Treadmill Study is a year long. This scan is done at the beginning, middle and end of his time frame. We’re halfway through! This test is critical to the study, and thankfully, such a low radiation that people in the room don’t need to even wear protective wear. It’s no more radiation than being outside all day (so they say…). The hard part about this is that once again, he has to be perfectly still, so the study staff want him asleep. I had woken Colten up from his nap when I met up with Jason and Shelley, but was not sure if we would get him to sleep so soon after that. Luckily, he cooperated and the exam went off without issue this time. I don’t have much to say about this exam except that I got a little more than I bargained for with the results. See, there aren’t many children that have DXA scans. So there’s no comparative data. Think child height and weight charts – a child falls into the 40th percentile here, the 60th there, etc… That’s because enough population data exists to even make that statistic. Not so with DXA scans. However, the study needs this data to compare the bone density changes over time. They will measure the children in the study (all with Spina Bifida Myelomeningocele) around 1 month, 7 months, and 13 months to see how density increases (that’s what they are hoping for in this study). To provide true power to those numbers, they need to compare it with the data from babies with Myelomeningocele that are NOT in the study, and with typically developing children. Mott still needs help getting children scanned, so if you can help them out, check out their website: http://www.med.umich.edu/engage/index.html . I think it involves children from 1 month to 18 months. Back to what I was saying – these test results mean so little to me because there’s no baseline or comparative data. However, today, I was able take a look at something that relates to the CT scan from the morning! When Colten fell asleep on the bed/table, he did what he always does – turns his head to the left, puts his fingers in his mouth, and drifts off to sleep. This left-lying position is possibly contributing to his head shape issues. Anyhow, this resulted in a pretty good profile scan of his skull, which shows the shape of his head so much more clearly than the pictures we take of him “live”. Obviously we will get a clearer picture from the CT scan, but those results we have to wait on. This was printed and given to me as I left Mott (labeled, of course, “non-diagnostic”, but who cares!). It was nice and frightening all at once to see the outline of Colten’s profile against images from the internet of scaphocephalic skulls and typical skulls. To me, this reaffirms that we were right on with our concerns and pushing for a CT scan to be done (the nurses were hesitant about there being any issue at all at first), even if they come back and say it’s not anything to worry about, the shape itself closely follows the shape for scaphocephaly. While I hope Mott calls and says “all is fine”, we are thinking that will NOT be the case. Here’s our non-medical, web-based, personal comparison findings… Make sure to read the caption embedded on the image grid to understand exactly what you are looking at. The most obvious comparison supporting our concerns is the upper right image we found, compared to today’s scan image. 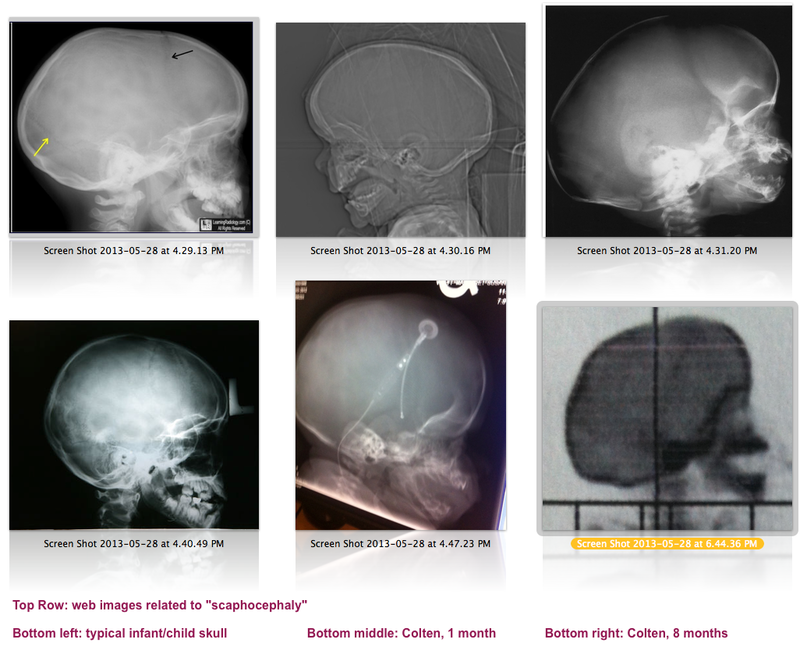 Comparison of various images found online, noting scaphocephaly occurrances and a typical skull. Includes a 1 month and 8 month scan of Colten. I put a call in on my way home from Mott today to schedule the CT followup. We are hoping this can be done via phone, at least to start. Hopefully we’ll get an appointment scheduled quickly so we can do what needs to be done to help Colten’s head and brain grow as needed. I’ll close this out by showing off Colten’s scar on his back. He is fortunate that his scar is small and straight – many of the kids have very jagged scars due to trying to piece skin together. Colten had so much skin on his back because his sac was so large, it closed up nicely. It goes from a little thicker on top to a thin pink line that goes right down into, well, you know. This entry was tagged friends, Mott Children's Hospital, myelomeningocele, scaphocephaly, spina bifida, Treadmill study, urology. Bookmark the permalink.